This card was again part of my Holiday Card Making workshop and part of the Class Card Kit. I really like creating cards like this. Last year I created one using the Home For Christmas stamp set (click here to take a look). Create standard card using Brushed Gold, in landscape form. Cut a 4" x 5-1/4" piece of Chocolate Chip. Emboss the upper, left corner with the "branch-like" stamp from Good Cheer. Stamp in Chocolate Chip Craft Ink, sprinkle with Clear Embossing Powder, shake off excess powder, then heat with heat gun. On the other side, emboss with Textured Impressions folder (use the Big Shot or Cuttlebug). I placed 3 gold brads in the bottom, right corner. You can wrap ribbon around and knot instead of or in addition to. Adhere piece to card front using SNAIL Adhesive. Color the Santa/Reindeer image with the above mentioned Stampin' Write Markers or colors of your choice. Then stamp in 3-1/2 x 3-1/4 piece of paper. Mat it on a Chocolate Chip piece of paper 1/8 inch larger on all sides. With the Real Red paper, crumble in your hand, again and again and again. Keep doing it until you get the desired distressed look. 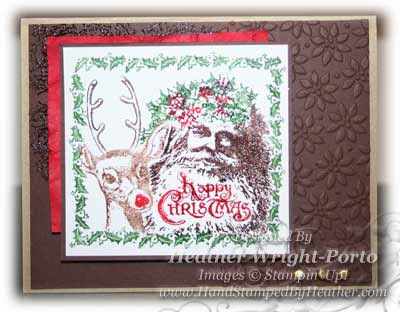 Then adhere Santa completed piece onto the red, off-centered, using Stampin' Dimensionals at least at the bottom, right side.